Warm Up: Your muscles need good blood flow to perform properly. Consider simple exercises such as jumping jacks to get warmed up prior to lifting tasks. Stand close to load: The force exerted on your lower back is multiplied by the distance to the object. Stand as close to the load as possible when lifting. Bend your knees: Bending your knees and keeping your upper body upright allows you to use your legs to lift, rather than your back. Grip the load: Do not lift a load if you can't get a good grip. Some loads are not too heavy, but are simply too large to grip easily. Consider lifting such a load with someone else. 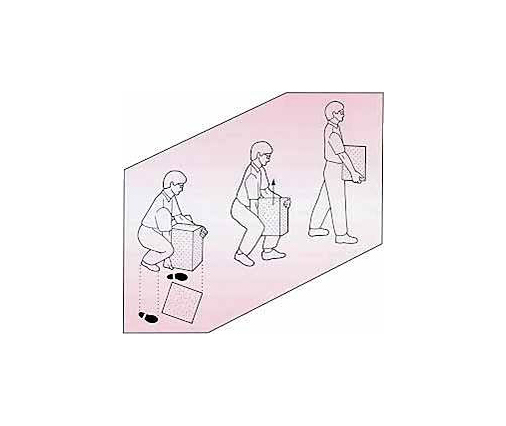 Lower load in reverse: You can just as easily injure your back putting something down as you did picking it up. Lower using your legs and keep the load close to your body.